This soccer shinguard meets all National Operating Committee on Standards for Athletic Equipment (NOCSAE) specifications. 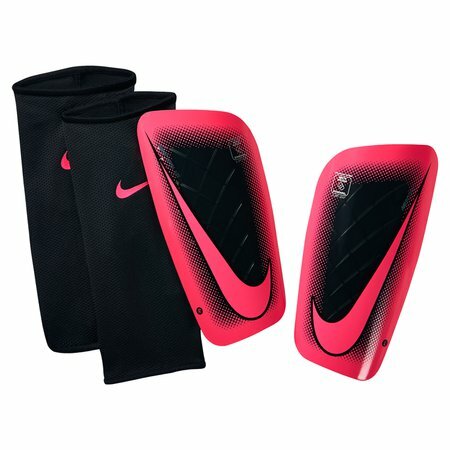 The Nike Mercurial Lite shinguard blends ultra-thin coverage with superior cushioning and impact diffusion for optimal performance that's designed to withstand the demands of the elite-level game. Low-profile construction provides protection that won't distract the athlete. Durable shell is bonded to a dense foam backing for impact diffusion. Anatomical left and right design is engineered for a natural fit. K-RESIN SHELL - provides optimal protection for the athletes. BACKER - Waffle Pattern EVA Foam provides impact protection as well enhanced comfort and breathability. DESIGN: Low-Profile Construction provides protection without distraction. FIT: Anatomical left/right design engineered, tested to fit contour of the leg. GUARD LOCK SLEEVE: Anatomical Fit Sleeve for enhanced Security, Comfort. NOCSAE Approved logo on shinguard.